Once I was able to sit down at the end of the event and see the response from Twitter and read what was in Zuckerberg’s notes, I realized this was pretty important information. I read some responses on Twitter — the photo was congratulated and celebrated by many fellow journalists, while others thought it was an invasion of privacy. Others simply saw the irony of someone’s notes being shared so publicly during a major congressional hearing on data privacy. The section in the talking points that got my attention, as well as that of many others, regarded Tim Cook and Apple. It never actually came up during his testimony, but Zuckerberg and Facebook were clearly anticipating questions pertaining to Tim Cook’s recent remarks on Facebook’s business model and privacy. Basically, the whole “If you’re not the customer, then you’re the product” argument. 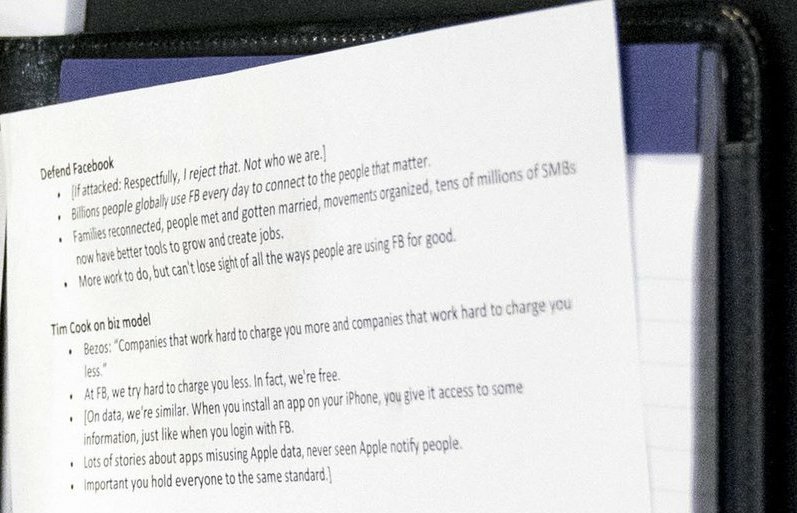 Zuckerberg used the first two points — citing Jeff Bezos’s quote about there being two types of companies, and asserting that Facebook is decidedly on the “working hard to charge you less” side of that equation — when he was asked about Cook’s remarks during his (excellent) podcast interview with Vox’s Ezra Klein last week. The speciousness of that defense was the subject of the column I wrote last week, so I don’t need to cover it here. The other three points — hoo-boy. To be fair, these are only prepared notes. Zuckerberg didn’t say them, and we don’t know if he would have if questioned about Cook’s remarks. So it’s not fair to treat them as though they’re actually quotes from Zuckerberg.1 But what a pile of horseshit they would have been if he had. On data, we’re similar. When you install an app on your iPhone, you give it access to some information, just like when you login [sic] with FB. There is almost nothing similar about how Apple and Facebook treat user data. Installing an app on an iPhone is nothing like signing in to Facebook. Yes, apps on iOS do get access to some data. But anything remotely private is only accessible to apps after the user has granted explicit permission for this access, and such access is also easily and clearly revokable in the Settings app’s Privacy section. Apple provides the user with clear control. Apple was, at worst, naive about what apps would do with unfettered access to users’ address books. Facebook is facing criticism today — and losing its users’ trust — not because they’ve been naive about privacy, but because they’ve been devious about it. Nobody is arguing that Apple collects too much data about users. If anything, I see some people arguing the opposite: that Apple is falling behind in the machine learning race because they don’t collect and aggregate enough data. And as for third-party apps collecting privacy-invasive data from devices, we now know that Facebook has been collecting phone call and SMS messaging history from Android devices — but not iOS, because iOS has never allowed third-party apps access to phone call or text messaging data. Zuckerberg should stick to the “some companies work hard to charge you more, other work hard to charge you less” angle. Trying to argue that Apple is in the same boat as Facebook on the privacy front is simply laughable.